Ididit 1955-57 Chevy Tri-Five Retrofit Steering Columns are made for Tilt Floor, Tilt Column and Straight Column Shift applications. Tilt Column Shift Columns include a neutral safety switch and everything needed to use your original dash indicator. For use with either 3 or 4-speed automatic transmissions. 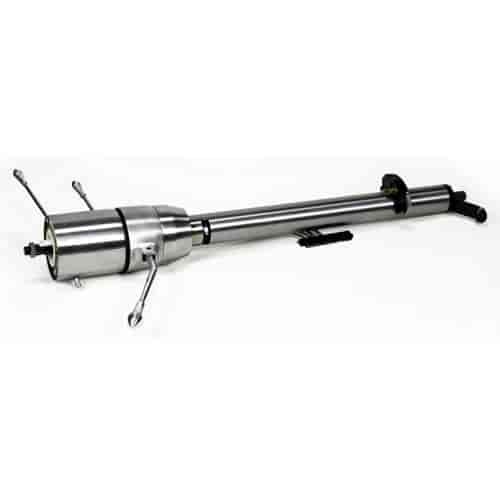 Attaches to the lower shift arm and requires a solid shift linkage for installation. These columns are available in your choice of paintable steel, chrome plated steel, black powder-coated steel, brushed aluminum or polished aluminum. . Warning: Compared to the original column, the 1957 Tilt Column Shift column will move the steering wheel 2" closer to your body. Use a straight 1957 column shift or a Shorty 9-bolt adaptor with an aftermarket Steering wheel to alleviate this problem.